This was my second foray into LGBT romance--the first was The Belle vs. the BDOC from 90's Playlist Anthology. I did not enjoy that novella. I was a little afraid to pick up another LGBT themed book, but the description on Netgalley had me excited about this book, so much so that I was chomping at the bit to read it. I've had this on my TBR pile since late September, but had to wait because it wasn't coming out until December 7th. Finally, as that infamous date approaches, I was able to sit back and enjoy it. Noah is a geoarcheologist for a Christian College in Northwestern Texas and he's taking a 6 month sabbatical to work on a book in hopes of making tenure. His writing is interrupted by Adrian, the guy staying in the RV next to his. He doesn't want to be attracted to Adrian (or any man) because he knows that those urges are sinful, but he can't help himself. Adrian is a videogame developer on vacation with a guy he's hoping to elevate to boyfriend status. When that guy strands him in Utah, he ends up getting a ride from Noah, who he believes is both straight and a homophobe. He quickly realizes that both of those assumptions are wrong and finds himself falling in love with the curmudgeon, who is struggling with who he is. Noah's struggle tugged at my heart. He knew who he was, but because of the way he grew up he has had a hard time accepting himself. His conflict was both internal and external. Internally, he was afraid to reach out, to fight for what he wanted because he had always been told that the thing he wanted was wrong. When he's introduced, he's made the decision to live a lonely, celibate life and he believes that this is how he's meant to live because he was offered a job at a very conservative school at the point in his life in which he was struggling to come to terms with his sexuality. He took this as a sign from God that he needed to suppress a very big part of himself in order to live a good Christian life. The external part of Noah's conflict comes in the form of his job and the morality clause he had to sign when he took the job. This is a reality faced by many in the LGBT community--even without the morality clause because a majority of states still don't have anti-discrimination laws in place, allowing gay and transgendered people to be fired because of something they have no control over. For Noah, because he signed this morality clause, acting on his feelings for Adrian could get him fired. He's worked so hard to get where he is and this puts added pressure on him to maintain the status quo. I have to say that I really hoped that someone at that school would stand up for him, but that wasn't the case here. As you can probably guess, Noah comes out to his boss and is given the option of "praying the gay away" or resigning his position. I do not consider this book to be Christian at all. The message was all about accepting yourself for who you are and not letting anyone tell you differently. The God-thing wasn't hammered into my head, despite the fact that Noah does consider himself to be a Christian and re-affirms this belief at the end of the book. What I liked the most about this book was how much Noah grew because of his relationship with Adrian, who accepted him for who he was and was willing to wait for Noah to be ready without pushing him for more. This is something that the best romance novels are able to do and Status Update did it wonderfully. It is because of Adrian that Noah was finally able to come to terms with who he was and what he wanted out of life. He realized that he deserved more than what he was allowing himself to have. My one issue was that the ending seemed to drag. I was fully expecting an epilogue as soon as Noah and Adrian decided to be together, but was surprised when I found several more chapters after this. I don't believe these chapters were necessary and could have been condensed into an epilogue where you find out that they're happy and what has happened since they got together. 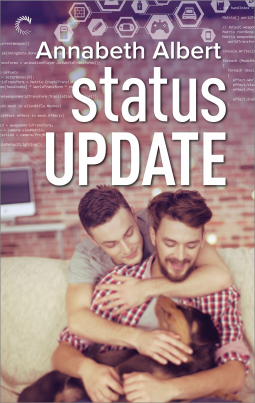 Status Update is the first book in the #Gaymers Series. It is currently available for pre-order and will be available on December 7th.